Peter Bartlett died in May 2018. 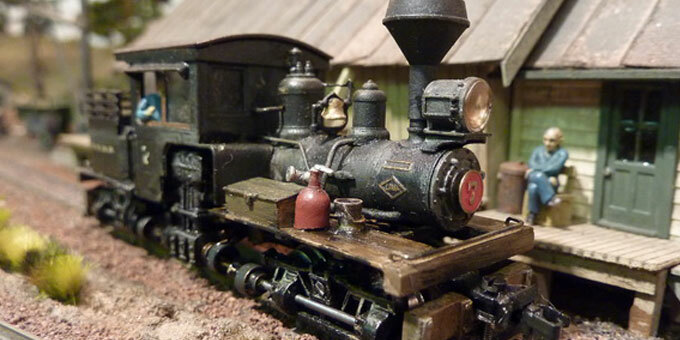 This website was designed by him to share his passion and enthusiasm for Model Railways. Please enjoy it and we hope it brings you as much delight as it did Peter. I’ve always been a railway modeler – at least since my teens, and made a 00 scale Great Western branch line in my parent’s spare bedroom. After a spell in the Army, I concentrated on my career in TV at the BBC. In the early 60’s I had a filming assignment in Berlin, where I discovered Eggerbahn trains in a local model shop. They were quite inexpensive, so very soon after there was a small circle of track in my hotel room. My enthusiasm for modeling was rekindled. A very short time after, I was on location In New York, and went to the model shop on W45th Street. In the basement – an Aladdin’s cave – I bought a book about the Maine two footers, and for a while dreamed about having a layout based on these railroads. Like many other Hon30 modelers, I was influenced by articles in the Model Railroad Craftsman, by Dave Frary and Bob Hayden about adapting Minitrains and using N scale mechanisms to power narrow gauge models. My job as a cameraman then took me to Tokyo and a pre-arranged meeting with Shozo Inoue, who later traded as “Flying Zoo”. Shozo introduced me to Sango and Joe Works. The Cray Valley - still to be built – had some motive power. The rest is a history of meeting the Hon30 fraternity over the years, and the help and encouragement I gained from them. Dave Frary is a friend (from whom I learnt how to build scenery and how to weather equipment), along with Bob Hayden, Bob Brown, who publishes the Narrow Gauge and Shortline Gazette, and the many others I have met, over the years. The Cray Valley started it’s life when we lived in Kew in London, and grew when we moved to Weybridge in Surrey where I had the use of a large building in the garden. Ten years ago we moved to Ireland and the railroad had a new purpose built workshop at our home in Killarney.